The previous post shows you pictures of a thunderstorm, and how to create a composite from the images. This one shows you how to make a video from the images. 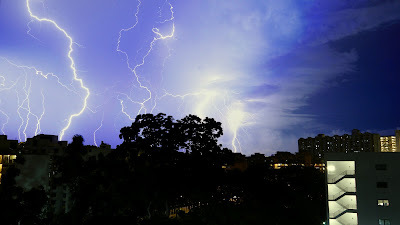 Two week-ends ago, a fairly strong thunderstorm struck, with clear views from my window. I mounted my camera on a tripod, and I took close to 1000 shots in about 45 minutes, each with 2 seconds exposure. The previous post shows you some sample pictures, as well as a composite of many lightnings. Composite shot, see previous article. This post will show you how to make a video from these images. Just playing those images at normal video speed (25 frames per second) will not work: because of the 2 seconds exposure I use, lightnings only appear on 1 images, at most 2. Played at 25 fps, each lightning would only appear for 1/25s: barely noticeable. I also do a bit of cropping, as my original framing shows some of the wall next to the window. Get the maximum between the last output frame and the current frame. Blend this maximum image with the current frame (93% maximum, 7% current): this is your next output frame. Iterate on the next input frame. The idea is that a bright lightning will appear immediately, through the maximum operator: if the frame is bright, at step 2, the current frame is the same as the maximum frame, therefore you get 100% of the current frame. For following images, the current frame is less bright, so the brightness decays at a 93% rate. That is, the lightning will disappear almost completely within 29 frames (slightly more than a second). See Wikipedia on exponential decay for more details. I tried different parameters, 90% made lightnings appear for a too short duration, and 95% led to significant artifacts: 93% seems to be a sweet spot. I output the maximum images as TIFF, as to avoid additional JPEG compression artifacts. The video can be seen in 720p on Vimeo, and in 1080p on Youtube (unfortunately, Youtube does not let me choose a good thumbnail image, so I switched to Vimeo for this reason).